After someone recently asked me if the philosophy I'm interested in is like that of Jordan Peterson and knowing there are a few others out there that have wondered the same thing. I figured I might as well give something close to an official Metaphysics of Quality perspective here. Now having completed the below review - I am surprised at how beautifully the MOQ puts perspective on this debate and how quickly I was able to get a clear handle of the arguments on both sides. Anyway - as is often the case with most post modern philosophy or whatever you'd like to call it - I often struggle to understand the ideas presented. 'Modern' philosophy or whatever you'd like to call it seems to me to be a bunch of intellectuals who are stuck in word games struggling within a bad metaphysics trying to describe something with words that don't easily match what they're trying to describe. It seems as if they've been asked to define a pen but not be allowed to talk, in any way, about writing. Because of this, and Jordan Peterson's strange and apparently contradictory logic on the first video I watched - the easiest way for me to understand his ideas was by the above Youtube critique where he clearly lays out Peterson's definition of truth and that of some of his opponents. It de-prioritizes the importance of 'objective' truth beyond our opinions of it. And hello here we are with two problems the Metaphysics of Quality solves. It's surprising but Peterson is actually correct in his definition but he is being limited by the metaphysics of his argument so is going to lose the argument. To be clear - the Metaphysics of Quality (MOQ) resolves the first objection by claiming that multiple truths can exist because it's not truth but Quality which is fundamental. There is one Quality that's the source of all things and there can be many truths. Truth - defined as a high quality idea - can change depending on the situation and what's pragmatically best at any time. The second objection is painfully stuck in a Subject-Object metaphysical (SOM) view of the world. 'If it's only Subjective then it can't be Objective'. - Every modern day philosopher. But what the MOQ makes clear is that man is the measure of all things. And that while he is indeed the subjective measure of all things - as Peterson alludes to - there is a moral thing called Quality that's beyond anyone's opinion of it - and is more real than anything else. Quality is experience itself. But being stuck in SOM Peterson can't say that and so he's going to get stuck in word soup and accusations of being plainly a subjective idealist as he apparently did in a long interview with fellow interlocutor Sam Harris. As an aside - what's interesting to me at this point however is that if he stuck with plain old idealism he might actually win that argument against the realists. Because the idea that a world exists 'out there' is indeed just that - an idea. We can say it's a very good idea from a MOQ perspective, and that's why it can indeed be true as well, but it's really an idea. But he doesn't want to stick to just idealism because he, as most people, appreciates the power of materialism and knows his argument will be weaker if that's the point he wants to make. So in conclusion, I'm surprised that, at least in regards to his conception of truth, the Metaphysics of Quality leans on the side of Jordan Peterson in this debate where he argues that truth is ethically tinged. But the MOQ by no means wholly supports his ideas as they end up in contradictions and word soup due to a lack of metaphysical clarity. Therefore I agree with some reddit posters, as linked above, that suggest he checks out Lila by Robert Pirsig which contains the first description of the Metaphysics of Quality which would greatly improve the intellectual clarity of his ideas. It's twilight for Subject-Object Metaphysics. These were the thoughts of a younger me. Stuck in school and no idea why I was there and what the point to it all was. And then, after hitting bottom I was given a book that beautifully answered all of these questions. And boy did the answer to these questions go far back into our history! Two thousand five hundred years, or there abouts, and we're only just now realizing an intellectual assumption that was made all the way back then was wrong. This is what was called the Ghost of Reason - and it was diagnosed in the most widely read philosophy book ever. Robert Pirsig found the cause for why there are these discrepancies and lack of explanations. Why do things exist and why we should do anything - answers to these questions lie at the heart of a new Metaphysics outlined by Pirsig which is far more intellectually sound than our current Metaphysics. But sadly the academic community has failed to take any interest, or any of these ideas seriously. But despite its popularity has anything really much fundamentally changed in our culture as a result of the insights found? It hasn't and it's well over time that it does! Certainly the academic intellectual community which still has much control over the power of truth is a foundational place where the insights ought to be taken more seriously. The antagonism from the this community as New-Age twaddle is unsurprising but disappointing. Disappointing because philosophical insights in the book aren’t actually wrong or incorrect. Unsurprising because for them to accept the conclusions of the book they would have to make some pretty dramatic changes. Each field of academic study from the first lesson would be directly linked to the Quality that creates, drives and connects everything. Fields would no longer be islands unto themselves but clearly connected to our shared experience and the improvement of quality everywhere. Academic papers would no longer necessarily be written with amoral, ‘objective’ conclusions but with moral recommendations of the best way for one to live in light of the findings. Areas of intellectual interest that have been neglected because of a disagreement on what quality or morality is and what the definitions of certain things are would be opened up to new academic inquiry. Some beginning examples are below although I can imagine this list would grow into the millions as insights are gained and things are moved forward.. Supporting society and its role . 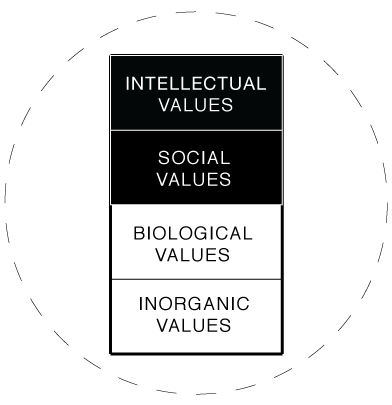 Explicitly investigate, using the scientific method, how best does society control biological values so they are valued for what they are whilst structured so that the strength of society, and the expression of intellectual values is also supported. What are good cultural traits that are supported by the scientific method? Celebrity and its impact on our culture. What values create celebrities? Are there better celebrities for us to admire? What do celebrities of the past say about our past? What can the academic community do to foster better celebrities? Many fields of scientific inquiry become an investigation of inorganic values rather than amoral a causes b relationships and the search for single truths. But until and after these changes happen - I’ll continue to write about how the MOQ can be used to create beautiful insights, support intellectualism and explain many things far better than our current metaphysics. Ancient Greece - in Color! Ancient Greece - what a vibrant amazing place. Think of white robes and stoic purity when thinking of Ancient Greece? Think again. I love to remind myself that it was a colorful and vibrant place, full of new ideas, intellectual arguments and the beginning of the creation of our modern day scientific understanding. Of course, it's not just the colors of the statues that were different than what we've thought for a long time. But indeed - the place of that intellectual explosion and what exactly happened all those years ago is widely misunderstood. It's time to revisit and re-understand exactly what happened all those years back then. Look out! We have Ancient Greek Socratics walking amongst us! They roam the streets of the world and question anyone willing to chat about their beliefs. Welcome to a growing phenomenon known as Street Epistemology. Just like Socrates, the adherents to this movement claim to only be interested in the truth! They strive to - at the very least - raise some serious doubts in their interlocutors mind whilst they have a friendly chat about what some of their beliefs are..
From a Metaphysics of Quality perspective this is on balance a good thing. Encouraging people to think further about things they claim to believe in is only healthy and mostly an invitation to be a better person who is more intelligent. Encouraging intellectual thought like this is moral according to the Metaphysics of Quality (MOQ). Belief from a metaphysical sense is a very slippery word and so is not supported by the MOQ. Quality isn’t something you believe in. Quality is something you experience. And unlike anyone’s belief it can be empirically supported. Folks can’t get out of bed without deciding that it's better to do so! That said, I think that Street Epistemologists, as with all modern day intellectuals, can improve their arguments around this so they are even more persuasive in their striving for the truth. An illuminating part of the discussion above is where the interlocutor, Madison, is clearly taken by Anthony's intellectual honesty and is curious to know what it is that drives his pursuit for truth. The answer he provides her as the 'believer' at first doesn't seem to satisfy until he provides a very curious closing sentence. "It's about trying to make the world a little bit of a better place." Madison looks curious as if asking for more..
To lay this out from a Metaphysics of Quality perspective - it should be clear here firstly that Quality is indeed what is driving his pursuit of the truth in that first sentence. The second sentence is even more curious however as he appears to imply that he simply believes that things are true as well. That's Truth! Based on a belief? Where's the 'solid foundation' gone? This seems like a simple problem that should have a simple answer but within a Subject-Object Metaphysics there is no such foundation. It is indeed only a belief that truth is fundamental and sound. And just like every other statement it is open to dialectical questioning. This is not the fault of Anthony but a clear metaphysical flaw of the Subject-Object Metaphysics from which he is operating. Of course the solid foundation of truth is Quality but he can't say that. He doesn't have the Metaphysics for it. It would for sure be interesting to have conversation with him about this. A future blog post perhaps? In fact it would be interesting to perform Street Epistemology in much the same way as Anthony does - for the most part very skillfully - but with a key difference. And that difference would be an explicit understanding of the foundation of truth and what we are all indeed stiving for and living. Quality. A Modern day Sophist. Metaphysics making things better - Psychology. There's no such thing as matter. There's no such thing as the physical. There's no such thing as ideas. There's just quality. What's a good way to describe reality? And if there's a good way - can you apply that quality to other things and find yet more quality? If something truly is good - then you would think it can pay forward like that right? "I am kind of in the position of a theoretical mathematician who comes… you know, who has worked out a set of equations which to him look wonderful. He goes to a group of engineers and they say, "Well, what good is it? What's this going to do for us?" Robert Pirsig to the Association of Humanisitic Psychology. Like Pirsig - I don't claim to be a psychologist - but what I do think is that at the very least - at a very high level - the Metaphysics of Quality can start to create interesting distinctions in 'human behavior' that haven't been brought out clearly before by psychologists. Looking at psychology from an MOQ perspective I can ask questions like - what behaviors are an unchangeable part of our biology and what of those are social? Whilst I'm sure these types of questions have been asked before - with the MOQ, we have a language with which we can discuss them and categorise them definitively and not get caught up on what exactly is social behavior and what exactly is biological behavior. Because it provides clear distinctions like this - from there anthropologists or psychologists can also ask questions like - if they are social - do they serve their purpose in an intelligent way - or is there a better way they can be achieved? If so, then obviously because they can be changed then it's best that we do so. And from this clear cultural recommendations can be made by intellectuals on the best way to live. Because this would be dramatically different let me repeat. Using the Metaphysics of Quality - intellectuals, could provide recommendations, based on human psychology, on the best way to live a moral life. Not just for some people in some such a culture. But for all people. Everywhere. I think this would clearly be a dramatic improval to the way things are done now. A psychology now whose terms are not clearly philosophically defined and also importantly - whose aims are also unsure. Because more than anything - it provides us an overarching frame that everyone can get behind and grounds us all in a moral direction towards a better future. Anyway, with this perspective from here I will be writing about psychology studies that I see that the MOQ can perhaps provide further color to and how the MOQ makes it uniquely clear that they can help us to live better lives.